Going away to one of the favourites for the League One title, it perhaps shouldn’t come as a surprise that teams will do so with a defensive approach. True to form, it is precisely what Neil McDonald opted to do when the team selections were announced. On paper it looked like it would be a tight and compact 4-5-1, although the eternal optimists out there could have claimed it was 4-3-3 when in possession. What we got instead was more of a 4-1-4-1, as shown below. Blackpool set up in a 4-1-4-1, with Connor Oliver the holding midfielder and Mark Cullen exposed up top. Connor Oliver was brought into the side and given the responsibility of sitting in front of the back four, while the only other change from the 2-1 defeat to Burton Albion in midweek was Tom Aldred who replaced Lloyd Jones. The change of shape meant that Mark Cullen was handed the uneviable task of ploughing a lone furrow in attack. The first 45 minutes involved more low quality football of the standard witnessed in the opening away game at Colchester, although that encounter did at least see Pool try to get forward from time to time. On Saturday, the focus was much more revolved around being tenacious, getting behind the ball and frustrating Sheffield United. For a long time that strategy appeared to be working with the Blades struggling to find any rhythm and resorting to hopeful punts up to Connor Sammon, whom the Blackpool centre backs seemed to handle for the most part. That said, it was the former Derby man who had the best, and really only, goalscoring chance of the first period, but his shot was deflected over by a brave Aldred block. Aside from that one big Sammon chance, it was an uneventful 45 minutes, although that won’t have displeased McDonald and Blackpool who at that point could argue the gameplan was working. The scoreline had been kept goalless and the team had worked hard to nullify the, albeit blunt, hosts in opening half. After the break, it was a different matter however. 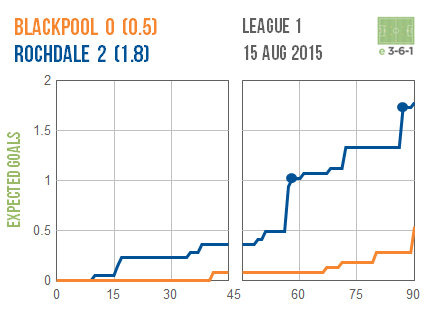 The thing is, conceding goals in the first half of games hasn’t necessarily been the problem for Blackpool. Six goals had been conceded in the three league games before the trip to Bramall Lane and five of those have been in the 56th minute or later. This should not be particularly surprising however. While a slight improvement on last pre-season, the build-up to the start of the league campaign was still less than ideal and has resulted in us being under-cooked. Thrown in the inexperience of the players, plus the fact that they’re still probably learning each others’ names (like most of the fans are, including myself – I had to double check several names when writing this post) then it’s only to be expected they will fade the longer a game goes on in comparison to their more organised, experienced and settled opposition. David Ferguson, who to be fair had had an improved first half compared to his display on the first day of the season, found himself more isolated in the second half and United began to target him more heavily. Sammon missed a glorious opportunity which came down Blackpool’s left side and Ferguson really started to struggle up against Jamal Campbell-Ryce who exposed the Seasiders’ young captain time and time again. As sure as night follows day, on the hour mark Pool did go one down and despite claims from McDonald after the game for a disputed foul on Emmerson Boyce, it was still a soft goal to concede. Billy Sharp was picked up by nobody and Kyle Letheren allowed the short to squirm through him way too easily. Once the first goal was conceded, it could have been four or five so restricting it to just two was the only silver lining in the end. Clark Robertson stood a couple of yards too far off the advancing Marc McNulty who finished smartly past Letheren into the far corner for the second. McDonald can, and indeed has tried to, claim that we were doing well until Sharp broke the deadlock, but the reality is that we should already have been behind at that point if not for Sammon’s glaring miss and playing for a 0-0 when we’ve already developed a habit this season for conceding second half goals is not the wisest gameplan. If you offer no threat yourself, the pressure will eventually tell, and that is indeed what happened. Blackpool were outshot for the fifth consecutive match in all competitions this season, but it wasn’t just the lack of shots that should be a concern, but also that the attempts Pool did make were from distance or set pieces. Indeed, it was the left back Ferguson who had the best two shots; one from long range in the first half that wasn’t a million miles away from finding the top corner and a decent free kick that came back off the upright. Those attempts aside, chance creation was at a worrying premium. Oliver put himself about in midfield with some dogged tackling, but when he did win the ball his distribution was nothing short of woeful. Fortunately for him, the information compiled by Opta don’t break down individual passing statistics at League One level, but if it did you would see a mass of striking red arrows depicting a large number of incomplete passes. The two midfielders ahead of him in central midfield did little better, with both Brad Potts and Jim McAlister wasteful when in possession. One of the few encouraging signs in these grim times has possibly been the emergence of youth academy graduates Henry Cameron and Bright Osayi-Samuel on the wings with their pace and direct style. Sadly, they saw too little of the ball and often were required in defensive situations rather than having any freedom to run at the Blades’ full backs. The most thankless task of the afternoon fell to the hapless Mark Cullen. A summer signing from Luton Town, Cullen impressed on the opening day both in terms of workrate and finishing ability, but he was dealt the duffest of duff hands at Bramall Lane. To his credit, Cullen carried on running and running but nobody got anywhere near him all game to help and given his small stature he had no chance of being able to hold it up and wait for reinforcements. All of this meant that the ball kept on coming back time after time. This continual pressure broke Blackpool’s resolve with the two goals in quick succession midway through the second half – no elastication to be found here, yet again. Jack Redshaw was introduced shortly before United doubled their advantage to make it a more attacking 4-4-2, but it was too little too late and once the deadlock was broken there was only ever going to be one outcome. It’s disappointing that Blackpool didn’t try to play to their strength, which clearly lies in attacking areas on the evidence so far this season. One might argue it was job done in that we kept the scoreline fairly respectable away to one of the league’s favourites, but such a pragmatic (or negative, if you will) approach when the club is now 204 days without a win is difficult to accept, whatever the reality of the situation might be. If you’re going to get beaten up, surely it’s preferable to get in a few punches of your own in there in the process? The question now is when will that horrendous winless streak finally be broken. Neil McDonald has gone on record this week as saying Blackpool “should have beaten Colchester, taken a point against Rochdale and won against Burton – but should and could are very big words.” However, it’s not really an outcome that my observations from the opening game, or the stats from the following two games bear out. Our friends over at Experimental 3-6-1, whose material we have relied upon in the past for the season visualiser and attacking and defensive effectiveness graphs, have come up with a new visual analysis tool this season based on the Expected Goals model (ExpG). The full explanation of the match timelines visual analysis tool can be read over at Experimental 3-6-1, but essentially it charts the 90 minutes of a match, plotting a line for each team based on the number and quality (i.e. location) of their shots to come up with a “expected goals” value, that shows the number of goals each team can be expected to score on average. 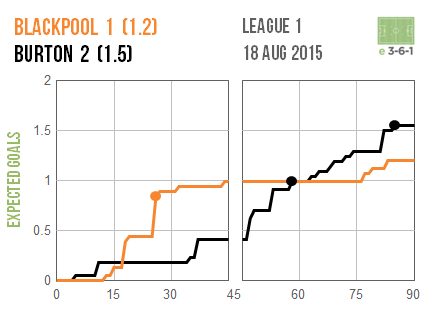 Looking at the timelines for each of the opening four league games so far shows Blackpool behind on ExpG in every game, refuting McDonald’s view that Pool should have taken seven points out of nine in the opening three matches. Even after clearly being second best on Saturday, McDonald once again played the hard luck card, suggesting Blackpool were hard done to as the first goal should have been disallowed. He has a case about the free kick, of that there is no doubt, but his team did not deserve anything from a game in which they were inferior to their hosts. 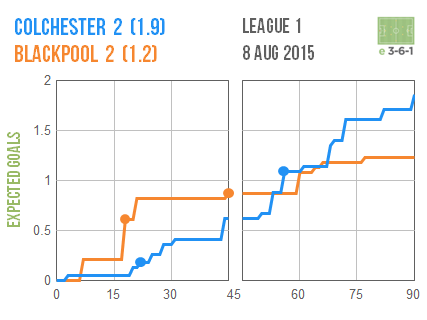 It’s not luck that is costing Blackpool results, it is quite simply quality which is the key difference. Behind the public facade, McDonald might well be aware of the grim reality, in that he has a squad which is woefully short in quality, experience and leadership. Media comments about needing “two or three” players are disingenuous. 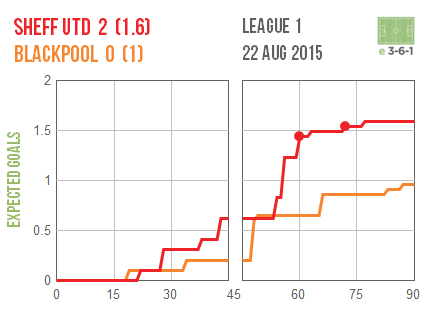 This Blackpool squad needs seven or eight, and that’s probably being conservative. The next four fixtures are all against sides who have either started the season well or are packed with experienced, solid League One players. It’s hard to see where a point, let alone a win, is coming from right now. At the moment, this is a squad that will get relegated to League Two, and might not even put up a fight in doing so. McDonald needs to pack in the company line if he wants any respect. Serious money has to be spent, and quickly. Readers can leave it up to their own imagination when deciding if this will happen, but if the manager believes in the words that come out of his mouth to the media, then we really are doomed.